Hot and fresh out the kitchen, it’s the Pizza Prize Slot! Powered by NextGen Gaming Software, this video slot takes place in a pizza parlor with graphics so good, you’ll be hungry for more. The game contains a Free Games feature which awards 15 Free Spins with double the payout amount. Join Tony as he cooks up some delicious pizza pies and prizes. And really, who doesn’t like pizza? 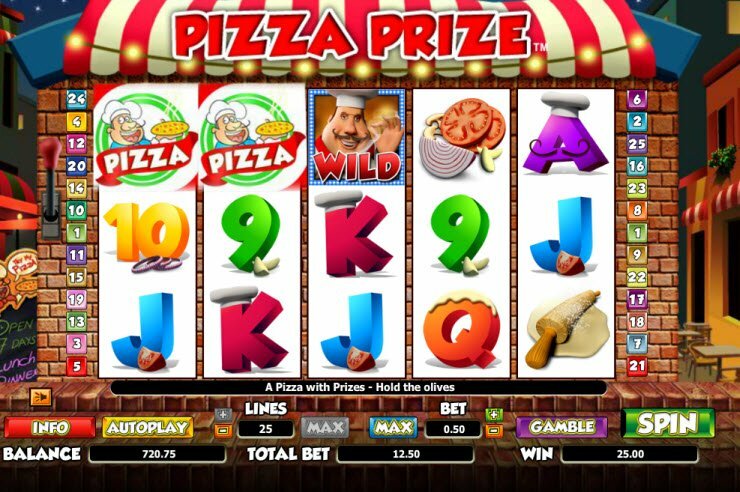 The Pizza Prize Slot contains high-quality 3D graphics and a cute pizza shop theme. Win 15 Free Games when 3 or more Scatter Pizzas appear on the reels. Spin the reels, and you’ll win payouts when matching images appear on one of the 25 paylines from left to right. Warning: This Game Will Make You Hungry! Whether pepperoni, plain, Margarita, Extra Cheese, or Hawaiian, Tony has got the perfect pie for you. Spin the reels and all sorts of yummy ingredients whirl and whizz across the screen. What will appear on your pizza? Onions, garlic, tomatoes, pepperoni, and cheese? Well, you’ll find all of these spinning around the reels as you play! When the images match up on a payline, they come to life and animate on the reels. Sometimes Chef Tony and his delivery boy greet you on the reels as well. Enjoy the traditional Italian music serenading while you play. The Pizza Prize Slot comes with lots of extra toppings! 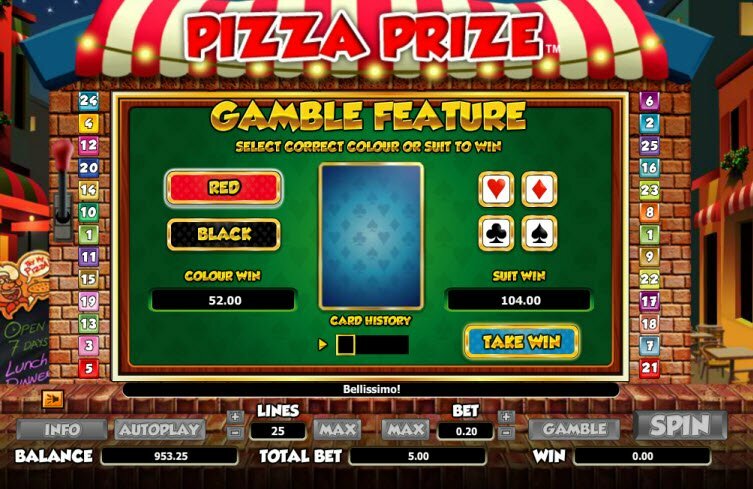 Win 15 Free Games when 3 or more Scatter Pizzas appear on the reels. The Pizza Prize Slot Bonuses come with lots of extra toppings! Win 15 Free Games when 3 or more Scatter Pizzas appear on the reels. 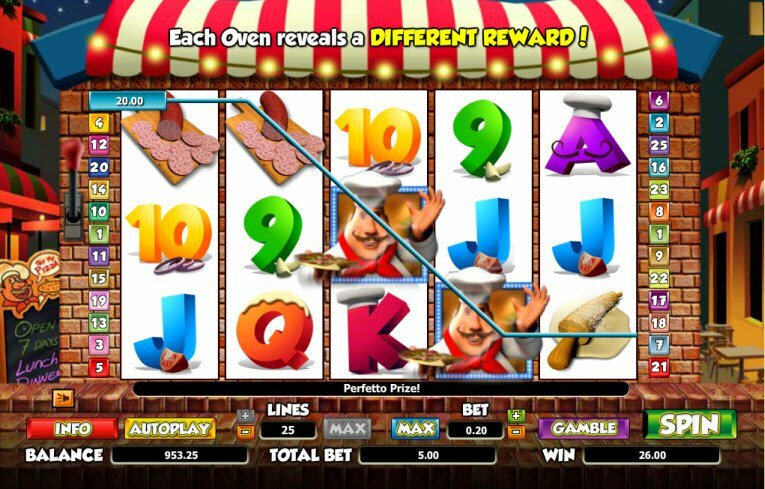 During this Free Game Feature, a Pizza Oven appears above each reel. When a Pizza shows up on any reel, the oven opens to reveal different prizes. The Pizza represents the Scatter and multiplies all wins by the amount bet. The chef serves as the Wild Symbol, and substitutes for all symbols except the Pizza Scatter. After any winning combination, you have the option of selecting the Gamble Feature round. During this game, you can guess the suit or color of the next drawn card. If you guess the correct suit, your win quadruples. If you guess the card’s color, your win doubles. You can gamble your winnings up to 5 times.